Available in two outstanding formats, this limited edition publication showcases the unforgettable opening sequences from the book recently voted "The Greatest Spy Novel of All Time". 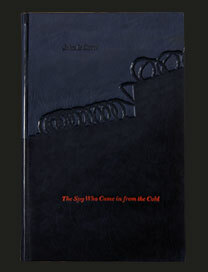 First published in 1963, The Spy Who Came in from the Cold bowled over critics and readers alike with its unrivalled storytelling and fresh, morally ambiguous perspective onto the "practitioners" of the Cold War. Since then, it has won panoply of international accolades, reflecting its crucial role within both our literary tradition and our social history. Each of our magnificent volumes is signed by John le Carré, and features an especially commissioned signed and numbered relief print of the author by internationally acclaimed artist Stephen Alcorn. 26 leather bound editions also feature a quotation from the novel inscribed by the author. One of the "All-TIME 100 Novels"
"The Greatest Spy Novel of All Time"
Trained at the Istituto Statale d'Arte in Florence, American artist Stephen Alcorn has won numerous awards for his portraiture and illustration work. His creativity and technical expertise in the field of printmaking have earned him global popularity and his artwork has been the subject of numerous articles in prestigious magazines. He lives and works in New York. Only 26 copies of the book (numbered A to Z) were commissioned by Oak Tree Fine Press in this format. Working within the constraints of both style and period each book has been hand tooled and bound in sumptuous selected leather featuring a stark visualisation of the Berlin Wall by one of Europe's most respected craft bookbinders. 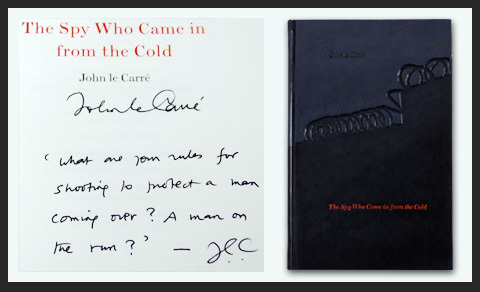 In addition each volume is signed by John le Carré underneath which he has inscribed a significant piece of text from the book. 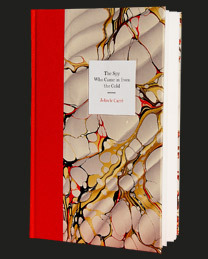 The book is made with hand made marbled endpapers from renowned craftsman Ann Muir and includes a signed and numbered frontispiece relief print by Stephen Alcorn. As each of these books is hand made to order please anticipate at least two weeks for delivery. 124 numbered hand bound slip cased volumes in Ann Muir marbled boards, quarter bound in rich red cloth to match the vivid dust jacket of the novel's very first edition in 1963. Featuring a tipped in signed and numbered frontispiece relief print by Stephen Alcorn and signed by the author.